By Geoffrey McQuilkin | Located high in the California’s Eastern Sierra, Mono Lake is an oasis for migratory birds, a popular destination for photographers and outdoor adventurers, and the source of a legendary piece of California water history. Mono Lake’s salty, alkaline waters support a unique ecosystem ⎼ instead of fish, a population of alkali flies and endemic brine ship numbering in the trillions create a vast food resource for nesting and migratory birds. More than 1.5 million Eared Grebes arrive each fall, relying on the lake as a vital resource on their southbound migration. Wilson’s and Red-Necked phalaropes similarly thrive on the lake’s plentiful food sources, molting feathers and fattening up for nonstop journeys to South America. Tens of thousands of California Gulls nest on the lake’s protected islands, creating one of the world’s three largest nesting colonies. Photo above: South Tufa Towers at sunrise. Photo courtesy of the Mono Lake Committee. Mono Lake is well known as a place for birdwatching, photography, hiking, and nature exploration. 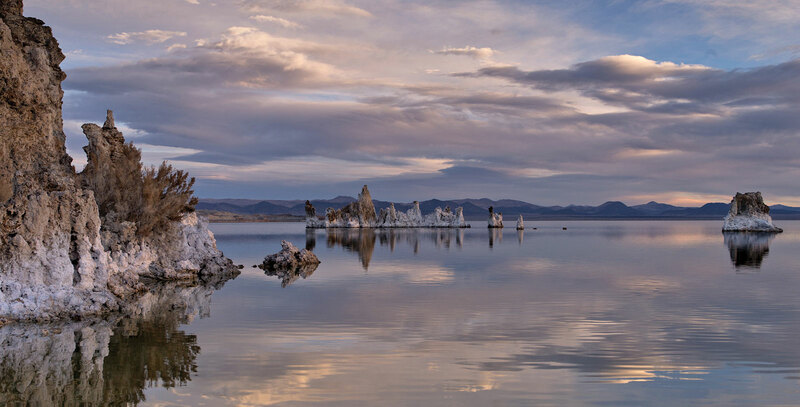 Tufa towers, formed of calcium carbonate deposited when springs mix with the unusual lakewater, rise from the lake creating scenic wonders set against the precipitous eastern slope of the Sierra Nevada. All of this was threatened by excessive diversion of water to the City of Los Angeles from Mono’s tributary streams. The Mono Lake Committee is the nonprofit organization that achieved the landmark success of saving Mono Lake from destruction as its level fell, wildlife suffered, and streams withered. The Committee revitalized California’s Public Trust doctrine through a precedent-setting state Supreme Court decision, launched programs to meet Los Angeles’ real water needs through water conservation and reclamation, and achieved an extraordinary revision of water rights in the Mono Basin that ensures Mono Lake will thrive and its tributary streams prosper. California Gulls next to the Lake Level Gauge that determines how much water will be released to Los Angeles. Photo courtesy of the Mono Lake Committee. Today, Mono Lake is likely the best protected salt lake in the Great Basin. An ecologically sound management level of 6,392 feet above sea level is required (today it is 6,381 and rising), and flow in the streams must meet minimum beneficial requirements. Scientific monitoring tracks progress toward the recovery of the lake and streams. Still, tributary streams suffered extensive damage ⎼ and for miles, complete collapse ⎼ and the lake itself has yet to achieve the mandated management level. It turns out that a great deal of work and dedication are needed to turn well-crafted decisions achieved on paper into actual landscape health. At the same time, new challenges have emerged, ranging from resource-strapped management agencies, to the California drought, to the impacts of climate change. The State Water Board established a water allocation method at Mono Lake that integrates resource protection with export for urban supply. Each year export amounts are determined by the lake level as measured on April 1; as the lake rises, increased water exports to Los Angeles are allowed. If the lake falls, water exports are reduced, and can even be set to zero when the lake is below a critical level. This year 4,500 acre feet of water can be exported, a sign of the lingering impacts of the drought; the Los Angeles Department of Water and Power (DWP) typically has exported 16,000 acre feet in recent decades. The State Water Board decision mandates restoration of the damaged streams below the points of diversion. The goal is to restore healthy self-sustaining stream systems including trout populations. While the initial Water Board order set basic flow requirements, it also launched a multi-year scientific process to determine the best way to manage stream flow to achieve restoration goals. Based on the work and recommendation of independent stream scientists, the Mono Lake Committee recently conducted three years of collaborative discussion, negotiation, and principled advocacy to achieve an innovative Stream Restoration Agreement with DWP that promises a healthy future for nineteen miles of tributary streams and certainty about the restoration of the fisheries, streamside forests, birds, and wildlife. Overflow spillway from Grant Lake Reservoir. hoto courtesy of the Mono Lake Committee. The Stream Restoration Agreement, negotiated jointly with California Trout and the California Department of Fish & Wildlife, is now being reviewed by the State Water Board. It implements a comprehensive plan for streamflow delivery, monitoring, and adaptive management built on the extensive scientific stream studies of the past fifteen years. In short, the Agreement will make the most of the water allocated to the creeks and lake under Los Angeles’ Mono Basin water licenses. Natural streamflow patterns ⎼ quantities, rates of increase and decrease, timing ⎼ will be mimicked to rebuild the health of the streams and fisheries, and rare bottomlands forest and channel habitat will be restored. Under the Agreement, collaborative planning will assure Mono Basin operations achieve both restoration and water export, costs will be shared, and compliance will be simplified. Additionally, scientific monitoring and adaptive management, directed by independent scientists, will assure that recovery is achieved. A key element of the Agreement is DWP’s commitment to invest an estimated $15 million to modernize antiquated aqueduct infrastructure at the Grant Lake Reservoir Dam by building a new Grant Outlet structure. Mandated peak flows are currently impossible to deliver due to the aqueduct’s World War II-era infrastructure specifically due to the lack of an adequate outlet facility. With new control valves, the new Grant outlet will demonstrate that the aqueduct can be overhauled ⎼ reconstructed ⎼ to serve both the goals of water supply for Los Angeles and, at the same time, the protection and restoration of Mono Lake and its tributary streams. Even as we celebrate progress made, new management challenges and protection issues are constantly arising. This year the Mono Lake Committee had to construct a mile of citizen-funded solar-powered electric fence in order to protect nesting California Gulls from mainland predators. The fence is the result of a year and a half of planning, a dedicated local installation team, and generous funding from Mono Lake supporters across the country. Why was the temporary fence (which was removed after nesting season) needed? Five years of drought lowered Mono Lake seven feet, shrinking the protective moat of water between the lake’s north shore and Negit Island and adjacent islets ⎼ exposing a landbridge that allows coyotes access to this long-established nesting colony. Last summer signs were found on some islets that coyotes had indeed walked the landbridge and then swum the remaining 500 feet or so of shallow water to prey on eggs and chicks ⎼ disrupting nesting and causing the gulls to be suspicious of returning in future years. The task was to install an electrified fence more than a mile from the nearest road, on exposed silty lakebed known for its thigh-sucking mud, in a barren environment subject to seventy mile-per-hour winds and baking sun. Plus the ends of the fence had to run into Mono Lake, so there was salty water, wave action, and the rising lake to contend with. Did it stop coyotes? Wildlife cameras and field observations indicate it did. During installation, numerous fresh coyote tracks were documented on both sides of the fence route, and on the edges of Negit Island. Follow-up field observations found that since the fence went up there have been no new tracks on the “wrong” side of the fence. Photos show searching coyotes unable to cross, and multiple sets of coyote tracks on the “right” side appear to show a direct approach to, and abrupt retreat from, the fence. Drought impacts have been many, but the winter of 2017 brought lots of precipitation and backcountry snowfields taller than any building in Mono County. With the snowpack fueling runoff exceeding 200% of average, Mono Lake Committee forecasts the lake to rise over four feet between its December 2017 low and March 2018. That is a lot of water, especially when you recall that Mono Lake is almost twice the size of San Francisco. Still, California’s five-year drought caused Mono Lake to drop nearly seven feet, so while this will be an impressively fast recovery, it will not be complete: the forecast for April 1, 2018 puts the lake 2.6 feet below its level at the beginning of the drought. Staff field trip to land bridge connecting Negit Island with the mainland. Photo courtesy of the Mono Lake Committee. In addition to protection and restoration efforts, the Mono Lake Committee runs education and science programs to share and better understand the lake and its streams. Scientific understanding provides the base for policy positions and an ongoing guide for restoration. The Committee works closely with the research community ⎼ running the Mono Basin Field Station to provide research support facilities, hosting a research library and online clearinghouse of Mono Basin scientific information, and supporting well-established projects like annual California Gull and Eared Grebe surveys. To share the sense of wonder that Mono Lake evokes, the Committee’s education program offers an array of popular experiential opportunities. Canoe tours, South Tufa walks, weekend field seminars, an annual bird festival, environmental education programs for schools, a robust volunteer program, and the popular Information Center & Bookstore in Lee Vining introduce thousands of people to Mono Lake each year. The Committee’s Outdoor Education Center provides programs for Los Angeles youth ⎼ connecting hundreds of urban students with the source of their water in the form of week-long watershed education trips. For thirty-nine years, the Mono Lake Committee has been inspired by a love for this beautiful place, where a remarkable salt lake lies at the center of a landscape and ecosystem unmatched elsewhere on earth. The Committee’s vision, shared with 16,000 present-day members, is of a healthy, protected, and wild Mono Basin, and of an organization that seeks positive, principled, proactive solutions to problems while providing constant vigilance to protect hard-won victories. If your travels bring you to Yosemite or the Eastern Sierra, be sure to include Mono Lake in your plans. Stop by the Mono Lake Committee Information Center & Bookstore to say hello, and we’ll point you in the right direction for the many wonderful discoveries that await you at Mono Lake. Geoffrey McQuilkin became a Mono Lake Committee member in fifth grade and his enthusiasm for Mono Lake has never waned. He has worked for the nonprofit Mono Lake Committee for over twenty years, including the past decade as Executive Director.A graduate of Harvard in the History of Science, Geoff lives at Mono Lake with his wife and three daughters.